YAY!!!! 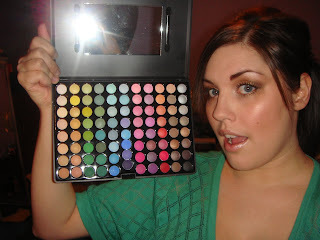 My Coastal Scents 88 Palette (the regular NOT shimmer) came!! Actually it came while I was away apartment shopping in Sask! I ordered it last monday, and it came on thursday, from Florida to BC Canada..4 Days! So Impressed!! And it came all in one piece, well packaged and all that!!! As for my thoughts! I love it!! 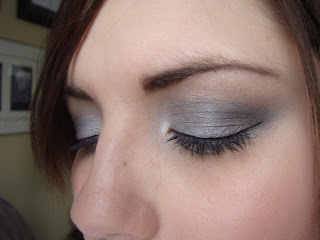 Most of the shadows are matte texture, only a few have a small amount of sparkleness to them. They have great color pay off for the price for sure...I personally dont believe that they are quite as high quality as MAC's as some people have said in regards to color pay off and blendability...they arent bad by any means, just not quite up to MAC's par!! They are pretty tiny, Id say 4 of them probably make up a MAC shadow. Some colors blend better then other, but overall its good quality for the price you pay!! I was a little intimidated by it once I first recieved it, it took me a few days...it was just so prettyful I didnt want to wreck it! lol! It was alot of fun when I dove in though!! Many colorful looks will come soon!!! If anyone wants swatches or what not I will be happy to do them for specific colors in the palette!! Maybe I will just do some eventually anyways!! So blogger and I are fighting today!! I thought my page was looking to busy with the bg and the image, so I opted for a plain white background (Im to lazy to go look for a new one lol) . But now it will not let me enter in hex codes to change my font color!! Grrr!! 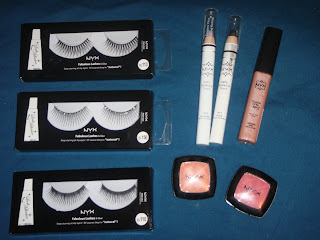 Anyways, while grocery shopping with the maja today, I bought some NYX stuff. 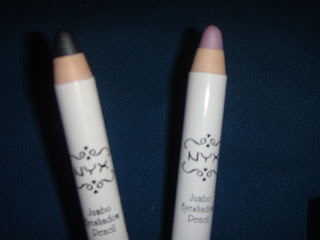 I had previously only ever had the White & Black eyeshadow (both which I love). 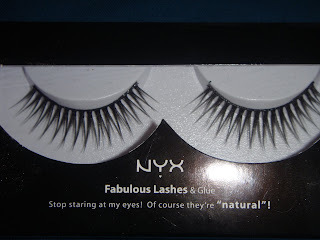 I saw the lashes and thought they were neat so I bought a few to try! Same with the Jumbo stick, was looking for the white but it was sold out, so I opted for others!! The collective haul pic of the goods! 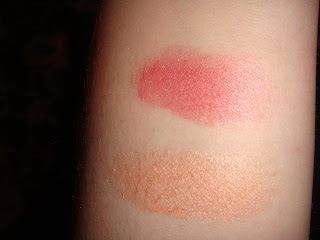 I forgot to take single pics of the shadows, but the left hand one in the pic above is 690 Orange and the right hand one is 54 Cherry, below are swatches. Cherry on top, Orange on the bottom. I saw a look I wanted to try of my friend at a fashion show thats why I chose these colors! 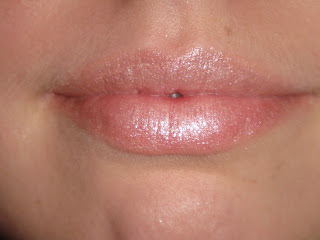 104 Sweetheart Lipgloss and below it on my lips. 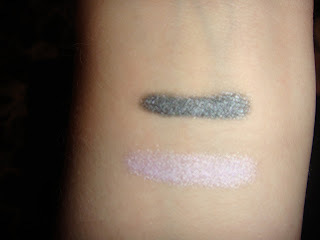 Jumbo Pencil Swatches Slade on top Lavender on bottom! First impressions are I love how smooth the pencils go on, simply effortless!!! 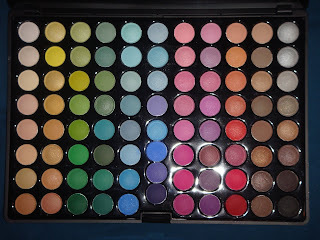 The eyeshadow colors were exactly what I was looking for, and I really believe they have a quality color payoff and you cant beat the price!! 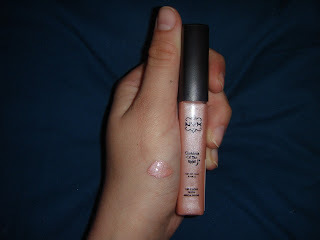 I bought the lipgloss simply just to try it out, I dont have any neautral shades in this style so I thats why i picked the color. Its very creamy and not super sticky feeling, and smells yummy! 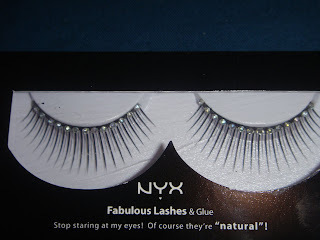 The lashes Im egar to try out. They looked neat thats why i grabbed them. 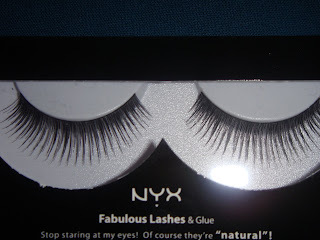 Will try them out soon and post pics!!! Is spring on its way?!? Its soooooooo nice out today!! The suns shining, the snows melting, I went outside without a jacket and wasnt cold at all!! Ahhhh, soo nice! I'm definately ready for spring!!! Ive lost/misplaced the cable to upload pics from my own camera somewhere in my house (I hope anyways)! Ive been trying to get things organized for moving and it's been put somewhere. 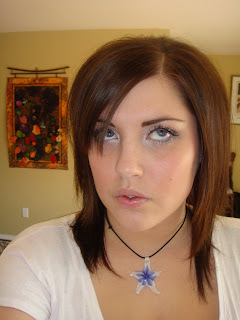 I borrowed my boyfreinds camera today to take a picture of the look I did. Nothing super fancy, just a simple day look. I was viewing a freinds pics on facebook of her trip in Austrailia, and I thought I would do something kinda with a beach feeling'ish (think sand an water)! 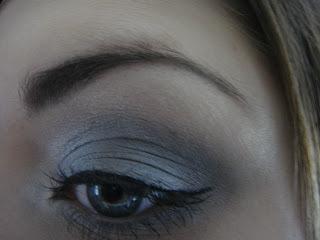 I plan on doing something like this again alot more dramatic...this is very much a simple look! Hopefully tomorrow I will hunt down that cord, today I really dont feeling like it. Im also contemplating what I want to buy at my MAC visit coming up later this week when I go to Sask!! What are your MAC cant live withouts right now?!? excuse the first two pics they are a tad purpley looking cuz of my bedroom color...I took the last two in my car for better color quality!